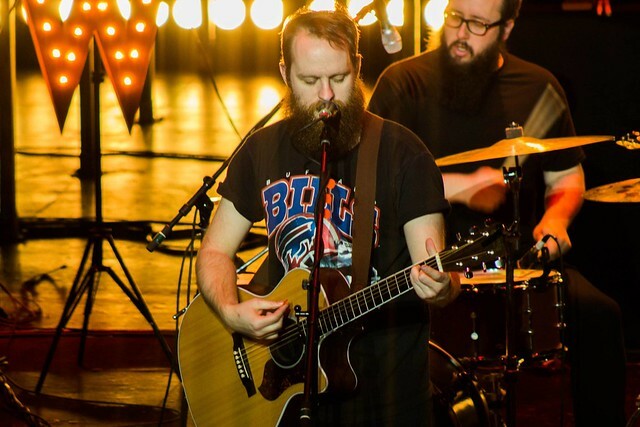 Pioneer Records and the Campus Activities Board at Point Park University hosted a show Nov. 1 featuring the retro rock band Super American, along with special guest bands Chase and the Barons and Young Lungs, at the Pittsburgh Playhouse. Production of the show was a full-scale collaboration between sports, arts and entertainment management and theatre production students. "This was another successful concert at the Playhouse for Pioneer Records and CAB. It's great to see our students across the University working side by side so smoothly to produce a fantastic show," said Ed Traversari, M.B.A., associate professor of sports, arts and entertainment management. Theatre production and SAEM students worked together to load in sound and light equipment as well as took on individual responsibilities tailored to their career pursuits. SAEM students covered merchandising, marketing, hospitality, contacts with the bands and more while the theatre production students ran the production end of things including lighting, back stage, stage management and sound. "We are so excited to provide a venue for these productions. They introduce our theatre students to events other than full-scale plays and musicals and the SAEM students learn more about the production end. Events like this are a large percentage of what the students will experience in the real world," explained Kim Martin, producing director of the Pittsburgh Playhouse. Martin added: "We had so much fun. It hardly seemed like work." Pioneer Records is a Point Park University-operated record label managed by the sports, arts and entertainment management department. Over the course of a semester, students working with Pioneer Records learn to sign an artist or band to a contract, assist in the development of a CD, secure the necessary intellectual property protection, develop a marketing campaign to promote the artist or band, execute a CD release/mp3 launch party, deliver a three-song EP to the artist or band and more. Read below what the current Pioneer Records student staff and interns have to say. "Pioneer Records has helped me to learn more about live entertainment and what goes on behind the scenes. This is only my second semester working for Pioneer Records, and I've already learned a lot about booking and marketing shows." "I have learned so much about the industry from Pioneer Records. Everything is so hands-on and you are really able to dive into doing the real work that you will do in the industry. I have gained so much experience." "Being involved with Pioneer Records compliments the education I'm receiving at Point Park quite nicely. It gives me the opportunity to take what we learn in the classroom and directly apply it, allowing me to understand the relevance of it all." "Being a part of Pioneer Records has given me the opportunity to work in a variety of areas from booking and promotion to leading show volunteers. All of these responsibilities are very similar to what I would be doing in the music industry if I was hired by a booking company or a promoter."